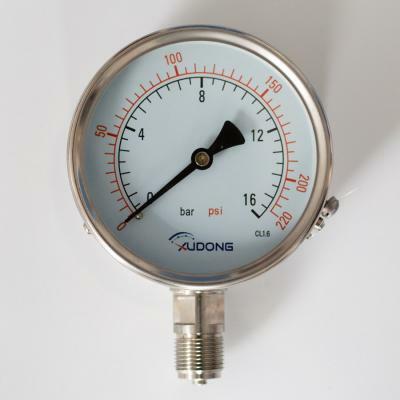 Because of the strong oxidizing property of oxygen, a special pressure gauge is necessary to measure the pressure of oxygen — oxygen pressure gauge. There are clear rules and indicators for oxygen pressure gauge in China. In a word, there are two aspects: do not contact any oil products in the parts production and the assembly checkout with red oil prohibition sign on the dial plate. The safety of the oxygen pressure gauge mainly depends on whether the whole production process of the manufacturer is strictly operated in accordance with the relevant state regulations. At present, many manufacturers use general pressure gauge after cleaning with carbon tetrachloride as the oxygen pressure gauge, which can easily cause safety accidents. So it is suggested that when you choose the oxygen pressure gauge you need to choose a good manufacturer. The model of oxygen pressure gauge has YO-60, YO-100, YO-150 and so on, and the pressure range is from 0 to 60 MPa. The main difference between the oxygen pressure gauge and the general pressure gauge is whether the oxygen meter is oil ban meter. That is to say, the final check of the assembly pressure meter is to check the instrument pressure by gas or water. And the ordinary pressure meter is checked by oil, because oxygen can not ignite automatically but it has combustion-supporting property, so it is necessary to ban oil.